Well, I was born in Johannesburg — a long time ago — in South Africa in 1929, and I was born into a Jewish family and I was born into a family who wanted a nice Jewish boy. And I’m afraid they were a bit disappointed, because I didn’t turn out to be a... a nice Jew… a nice Jewish boy. And as neither of my… my father had actually been born in Belfast and he came to South Africa when he was quite young and he became an office boy at about the age of about 14, 15. So he had very little formal education and certainly my mother didn’t have any formal education, but I had quite a lot of distinguished... uncles and in fact, one of the adults I really liked when I was a child, was my Aunt Helen — Helen Suzman — who’s very famous in terms of being against apartheid in South Africa. But as a child, I became quite early on, involved… not quite so much in science, but I built aeroplanes — you know, balsa wood aeroplanes — I had a Meccano set. At the age of about 13, 14 I could build a radio. It didn’t work terribly well, but... but it wasn’t bad, and the... one of the things I was obsessed was... with was wanting to be able to fly an aeroplane, so I would read books about how aeroplanes flew and how one had to... I would sit and pretend I was flying one with a joystick and... and so forth. And at school I was moderately good at science and maths, and I finally matriculated and I got a First Class in mathematics and then I had to decide what to do. And that was quite difficult. 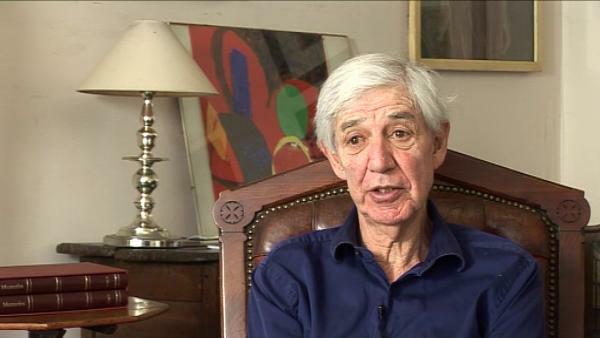 Born in South Africa on October 19 1929, Lewis Wolpert CBE FRS FRSL is a developmental biologist, author, and broadcaster. He was educated at the University of Witwatersrand (BSc), Imperial College London, and at King's College London (PhD). He is currently Emeritus Professor of Biology as applied to medicine in the Department of Anatomy and Developmental Biology at University College London. In addition to his scientific and research publications, he has written about his own experience of clinical depression in Malignant Sadness: The Anatomy of Depression (1999). Eleanor Lawrence is a freelance science writer and editor, and co-author of Longman Dictionary of Environmental Science.